COME SEE US AT FLAMECON! SERIOUSLY! IT’LL BE RAD AS HELL! Longshot Saves the Marvel Universe is a delightful series and you should all go read it immediately. You heard it here first: No wang beams. NEXT EPISODE: X-CUTIONER’S SONG BEGINS! NO, SERIOUSLY, COME TO FLAMECON. Jordan D. White is a delightful individual, and you should both follow him on Twitter and check out Sailor Business! Lewis Tan, who played the character in Deadpool 2, loves Shatterstar very much. Here’s the official Uncanny X-Men press release. In which we welcome Marvel editor Jordan D. White to the podcast to talk about the current state of the X-Universe! 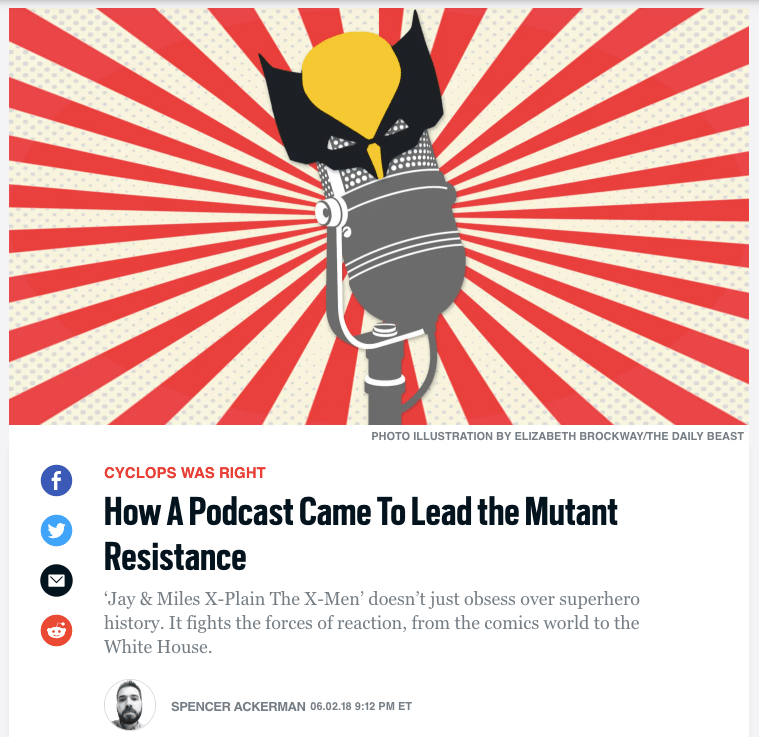 Click through for the full article, including a lot of mutant metaphor talk and some incredibly blush-inducing quotes from some Very Important People in the X-universe. NEXT EPISODE: X-Factor vs. Celestials! We covered the first half of the Asgard Adventure in Episode 127 – Disaster City. COME SEE US AT VEGAS VALLEY COMIC BOOK FEST ON NOVEMBER 5! It’s an awesome convention, and we will be doing a VERY SPECIAL live show. In which Rusty is an honorary Bluth; we bid a sad farewell to Bret Blevins; Hogan the Grim is probably the best at bedtime stories; Asgard has really tight hat game; Hela is a remarkably competent supervillain; there are some sound effects you have to earn; Rusty and Skids fight the Vulture; and Miles has so many feelings about Thor. NEXT EPISODE: X-Factor vs. Celestials, as Judgment War concludes! Welcome to Imzy, J&MXtX-M! Hope You Survive the… You Know. Jay here, with a brief break from our regularly-scheduled programming! Along with a handful of other podcasts and communities, we’re part of a very small closed beta for a new community-oriented social platform, Imzy; and we’re very pleased to finally be able to invite you to join us! If you’ve been around long, you may have noticed that we keep a pretty tight lock on the social media we use. We don’t have a Facebook page. We use Tumblr very casually, and largely to boost and crosspost material from our website. Our YouTube comments are permanently disabled; and we do everything we can to direct discussion to the comments here. There’s a reason for that: it’s incredibly important to us to have our community spaces be fun, civil, and safe; and for those qualities to be supported at an infrastructural level. The community that has come together–largely independently–around this podcast is freaking amazing. You are some of the most engaged, enthusiastic, and all-around nice people we’ve ever met, on or off the Internet. And we want to keep it that way. Which is part of why we’re excited about Imzy. It’s explicitly oriented around communities–think the rough structure reddit with actual oversight, infrastructure, and active anti-harassment tools. If it works the way we’re hoping it will, it’ll mean a community that you can post directly to–not just comment on our stuff–and a lot of new ways to engage. Here’s how it works: Click over here, and enter your info; and we’ll get back to you with an official beta invite ASAP! We’ll also have physical cards with invite codes with us at ECCC. On April 13, 2014, we posted the first episode of this ridiculous little podcast: two nerds, at a table, explaining the convoluted continuity of one of our favorite comics. Almost two years later, it’s like looking back from a different universe. Our weird hobby has become a part-time job. We’ve interviewed some of our favorite creators; traveled across the country; thrown parties and panels; shown up in an actual X-Men comic; been part of an enormous crossover; and explained a quarter of a century of comics continuity. We’ve gone from an audience of friends and family to around 15,000 regular listeners–who, together, have become one of the coolest and tightest-knit communities we’ve had the privilege to be part of. And you’ve been with us through a lot. In addition to all the stuff above, you turned out for two (soon to be three!) live episodes. You’ve been there through our tenth wedding anniversary; a gender transition and name change; and–as of this week–100 episodes of Jay & Miles X-Plain the X-Men. To you, listeners, for sticking with us through 100 episodes of time travel, crossovers, and clones. To our Patreon subscribers, who let us keep doing what we do ad-free and answerable only to our listeners. To Kyle Yount, our current producer, who makes us sound way better on the air than we do in the studio. To Bobby Roberts, our first producer and podcasting mentor, who set one hell of a high bar, and without whom it’s fair to say that none of this would exist in the first place. To our illustrator and friend David Wynne, who’s bridged what we do back from the audio to the visual. To AdminstratriX Tina, mistress of the spreadsheets and question files. To the creators, guest X-Perts, and co-hosts who’ve brought their voices and ideas to our show: Elisabeth Allie, Kris Anka, Marguerite Bennett, Chad Bowers, Elle Collins, Russell Dauterman, Kieron Gillen, Dennis Hopeless, Graeme McMillan, Peter V. Nguyen, Annie Nocenti, Paul O’Brien, Jeff Parker, Greg Rucka, Kieran Shiach, Chris Sims, Si Spurrier, G. Willow Wilson–and last, but far from least, today’s guest: Chris Claremont. To our off-air partners in crime, Katie Moody and Anna Sheffey, who are just the absolute damn best. 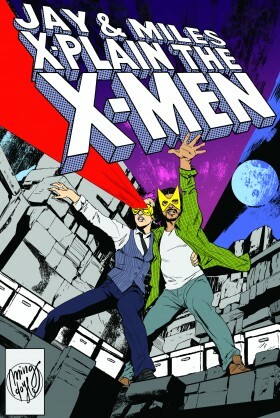 And to the many, many other friends and collaborators who’ve helped make Jay & Miles X-Plain the X-Men what it is. Here’s to the next 100. This is not a photo of us. This is a photo of listeners @StudentofWhim and @Biscainer, who decided to celebrate the new title and URL by cosplaying as the versions of us from our cover art, which is unquestionably the most awesomely Borgesian thing that has ever happened to us in nearly two years of X-Plaining the X-Men. iTunes should be showing the correct title now or within the next few days; and your feeds should update automatically. We’re still working on getting Patreon and Redbubble updated; we’ll let you know as soon as those are moved over (for now, they’re right where they’ve always been). Obviously, this is a big shift, and it’s involved a lot of coordination, so please pardon any hiccoughs in the days ahead; and let us know if anything’s running wrong, or if you notice the wrong name anywhere! November Shirt of the Month: ALL OF THEM! We were going to wait to announce this until November proper, but we were so excited waiting for the beginning of Secret Convergence that we decided to jump the gun and launch a couple days early. November’s shirt of the month is… ALL OF THEM. Every shirt of the month ever, back in our store. Check out the designs below–and then read on for a big announcement about the future of the Shirts of the Month! NIGH INVULNERABLE WHEN BLASTIN’ – The shirt that started it all! LILA CHENEY LIVE AT WEMBLEY STADIUM – We made this shirt just so we could get one. WHAT WOULD PETER CORBEAU DO? – In the end, there’s only one question that really matters. MY OTHER SHIRT IS A DEMON BEAR – Off the map and on to your torso! DEMON BEAR LEGGINGS – Because you demanded it! NOBODY KNOWS I’M A CLONE OF JEAN GREY – But really, aren’t we all? THREE WOLVERINE MOON – Yes, we are aware that wolverines are not wolves. That’s what makes it funny. X-GAMERS – Who needs a Danger Room when you’ve got a Monster Manual? I SURVIVED SECRET WARS – Crossover events come and go, but poop jokes are forever. 616 OR BUST – The multiverse is waiting! FIRST: The nature of the Shirt of the Month program means that either we have to pull some of our favorite designs after just a month; or we swamp the store. SECOND: Because of the first problem, there are designs–ones we really want to do and suspect you’ll really want to wear–that we’ve been sitting on for ages, both because we don’t want them to disappear and because we’re swamped with the monthly stuff. During NOVEMBER and DECEMBER, every shirt of the month (and the Demon Bear leggings! )will be on sale in our shop; and we’re also putting those designs on some new products! Beginning in JANUARY, we’ll be adding some of those shirts to our permanent selection and phasing others out. We’re not yet sure which; so if there’s one you’ve got your heart set on, NOW IS THE TIME TO GET IT. From January on, there will be no more shirts of the month. Instead, we’ll be adding new designs–and sometimes phasing out old ones–as we come up with ideas we want to do. THAT DOESN’T MEAN THE END OF LIMITED-EDITION SHIRTS. One of the things we want to start doing in 2016 is collaborating with local printers to do limited-edition shirts, probably on a pre-order system. They won’t be monthly–but they also won’t be constrained by Redbubble options, which means things like full-bleed designs and a larger size range on limited editions. EDITED TO ADD: Yes, all our other shirts are still up, too! You can find the whole kit ‘n’ kaboodle at the shop home, or just the shirts of the month over here. We’re Going to Vegas Valley Comic Book Festival! Rachel here! We are super pleased to announce (okay, we’ve been tweeting about it for a few weeks, but STILL) that we’re guests at the 2015 Vegas Valley Comic Book Festival on November 7! We’ll be doing two panels–including our second live episode! For those of you who caught the Rose City show, this one’s going to be a little different–more continuity, for one–so we really hope you’ll come out and join us! We’ll also be tabling all day, with t-shirts, buttons, the second printing (!) of the zine, and more! VVCBF seems like a really cool show: free, library-run, with an awesome guest lineup. If you’re in the Vegas area, come out and say hi! !